This pendant sports a unique double tassel made with chain and beads. The chain reflects light from multiple angles as it gently swings on a black cotton cord. The pendant is relatively quick to put together and can be made using a variety of materials. 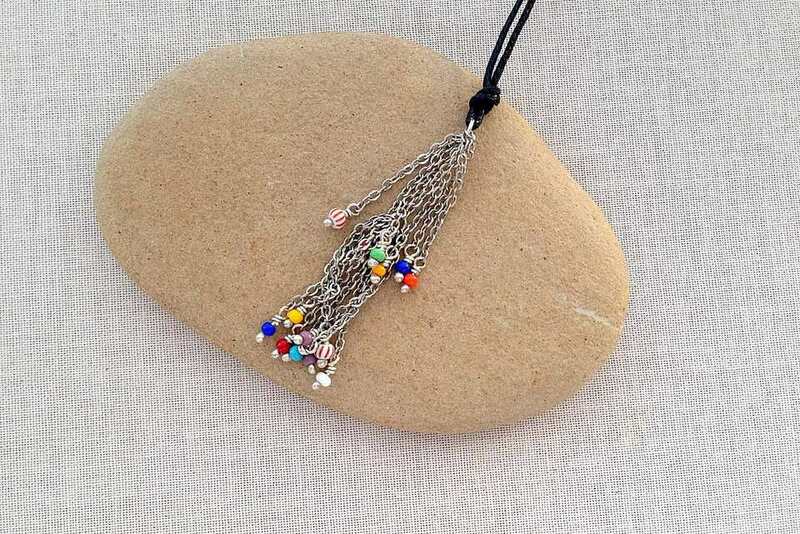 It is especially good for using up odds and ends of chain that may come from a broken necklace or that you simply don't have enough to use for another project. For my tassle, I wanted to use some fine weight curb chain that was already cut into small pieces from a previous project. I also had some small ball headpins made using silver wire that were just too short for most beads and projects, and some bright colored glass seed beads. You will also need a few jump rings that the loops of the chain will fit on. I considered using the round silver beads, but decided with the ball headpins, I didn't need to use them. The pieces of chain for my tassels are about 1 inch long each. With fine chain, the easiest way to get pieces the same size is to dangle the chain off a scrap piece of wire, line them up and snip a link below the length that you want the piece of chain to be. It can be difficult to be sure that you cutting the right link, so when in doubt, I always try to cut one link below where I think I need to cut. It's always better to have the chain long and cut an extra link than cut it too short and not be able to use it - or even worse, have to trim all the other ones to match. With larger chain, you can sometimes count the number of links, but I still find it easier to do it this way. To add a little weight and color to each tassel, I added seed beads using wire wrapped loops. I tend to make beaded chain in an assembly line method to make the process go a little more quickly. Doing it this way allows you to use a tool more than once before moving on to the next tool. Make a total of eight to twelve chain and bead pieces for each tassel. The total number depends on how full you want your tassel to be. Make your first chain tassel by adding the chain ends to a jump ring. I used a small 3.5 mm jump ring made from 20g wire, but you can use a slightly larger jump ring if that is appropriate for your chain. The jump ring may be slightly visible when the tassel swings with your movement, so a jump ring that is on the smaller side will work best. Before closing the jump ring on your first tassel, add one more piece of chain that has no bead dangle on the end. This chain is used to connect the two tassels. I made this piece of chain slightly shorter by about 4 links than the pieces with beads on them - so if you trim one too short, this is the perfect way to use it! Make a second tassel following the same instructions as the first one. Before you close the jump ring, add the empty piece of chain from the first tassel. Close the jump ring. Slide the tassels around the jump ring so there is an equal number on either side of the chain connector. This is your finished chain tassel. I added a larger jump ring and knotted the pendant in the center of a 25 inch piece of thick waxed cotton cord using an overhand knot. So far, I haven't decided if I like the necklace better as a choker or a longer necklace, so I haven't added a clasp to the cord yet. I have loosely knotted it in place. The final tassel beaded tassel has a lot of movement. I think it would look great as earrings since they are relatively lightweight.